Venting – Our standard buildings include at least one air vent. We encourage additional options for venting as sheds can get very hot during the summer months. Ask about our options for additional venting or even consider adding our skyvent feature. Building Permit/HOA Requirements – It is the customer’s responsibility to confirm building code requirements, permit requirements, and/or setback requirements with his/her HOA and/or municipality. Please contact our office if you need help. Clearing the Site – Clean the site of all debris (tree stumps, shrubs, plants, dog waste, trash, etc.) and create a clear pathway to and from where our delivery vehicle will park. 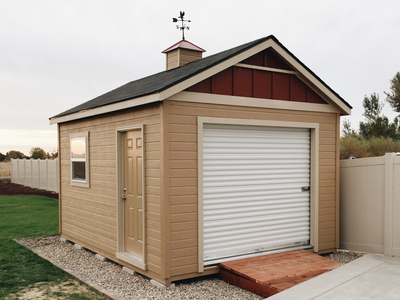 Leveling the Site – Assembling your storage shed on a level foundation ensures that your Stor-Mor Shed will function correctly and efficiently for many years to come. This requires you to provide us with a level site. Extra charges apply for leveling an area, however, leveling the site with extra blocks/shims doesn’t always give the customer the professional finished look they desire. To remedy this, you may need to prepare an unlevel area with road mix or gravel before we arrive. Please see your sales associate for details. Prefabrication Process – We begin the prefabrication process of your shed up to five days in advance in order to guarantee your shed is assembled on schedule. For this reason, all changes to your order are required within 5 business days of your scheduled installation to avoid extra charges. Restocking/Rescheduling Fee – If changes to, rescheduling and/or cancellation of an order occur within 5 business days of installation, a reschedule/change or restocking fee may apply. At this point, your building materials have already been ordered and the prefabrication process has been started. Late notices of rescheduling/cancellation or changes prevent us from scheduling another project in place of yours. Your Stor-Mor crew will arrive on site, unload materials and begin the construction of your new shed. Please make sure an adult is able to meet the crew and show them where to place your structure. An out of level area will force our installers to stop work and collect an additional leveling fee prior to resuming. Failure to obtain your authorization to complete this work and receive payment may result in a delay of your project's completion. Our installers will need a power source within 100’ of the build site to use for their compressors and hand tools. The weather seldom interferes with the installation of your shed. Rain, snow, and sleet will most likely not prevent installation. Ask for details. 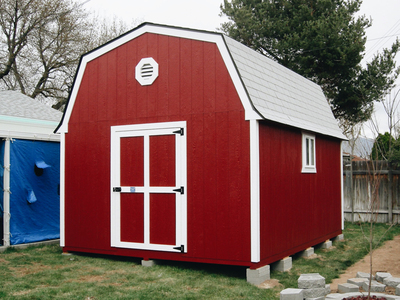 Your Stor-Mor Shed will need care and maintenance to sustain its functionality and looks. Redirect all Water – Water is not a friend of wood structures. Make sure to redirect water from your building whenever possible. Damage caused by rain water runoff from other structures or misdirected sprinkler systems is not covered by your Stor-Mor warranty. Keep your building leveled – Over time, normal ground settling can occur, making it difficult to open, close or latch the shed door. This is not a warranty issue, but in most cases, the shed can often be easily re-leveled by the customer or by Stor-Mor Sheds for a fee. Repaint regularly - Painting protects the exterior wood surface of your building. Your building’s warranty coverage requires that the building be repainted every eight years. Ventilation – When installing a shed on dirt or grass, it is imperative that air flow is not trapped around the floor, as this will most likely lead to moisture problems over time. Our wood framed floor buildings are constructed on concrete patio blocks and our steel framed floors have air holes for ventilating purposes. Blocking either the holes on the steel frame or the gap under the building created by the patio blocks will likely trap moisture under the building and cause damage to the floor. Settling that occurs over time, resulting in a blockage to this air gap, may also cause damage. This is not a warranty issue covered by your Stor-Mor warranty. Roofing nails – it is normal for roofing nails to poke through the roof on the inside of your building. This is necessary due to building codes requiring shingle nails to pierce the roof decking material and does not affect the performance of the roof. Lumber – it is unlikely that the dimensional lumber we use will have a uniform appearance. You may see blemishes or waning in the lumber, but be assured this is normal and will not affect the structural integrity of your building. Steel – Our steel framed floor is left in a galvanized state and chalking may occur. Rest assured that this is normal. Weather tight or Airtight – While we strive to make all our buildings weather tight, they are not airtight. Air and mice can infiltrate your building as they can your home. Paint – Our painting option applies to the exterior surface of your building only. We do not offer interior painting.